Reliance Spice & Food mixers are used in the food industry to mix spices, sugars, liquids, and other ingredients. Spice mixers are medium intensity mixer that are made out of stainless steel and are highly polished. The design and construction can vary depending on the application and ingredients to be mixed. Choppers can be added to break down the creation of agglomeration due to the introduction of liquid ingredients. Many applications call for low-shear mixing and can require more tumbling and longer mix times. All internal/product contact areas are made of High Grade Stainless Steel. Many applications call for stainless steel non-contact areas as well. 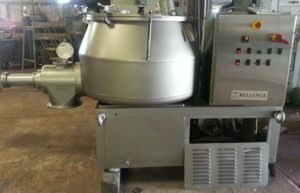 Horizontal Spice & Food Mixers consist of a long horizontal mixing chamber and consists of a shaft that enters through one of the end plates. The shaft typically has arms that are welded or bolted and extend to the opposite end plate. Horizontal Spice and Food Mixer applications range from doughy material to dry ingredients in need of a homogeneous mix.